Tracksounds: Special Appearance by Howard Shore and Doug Adams in New York! Special Appearance by Howard Shore and Doug Adams in New York! 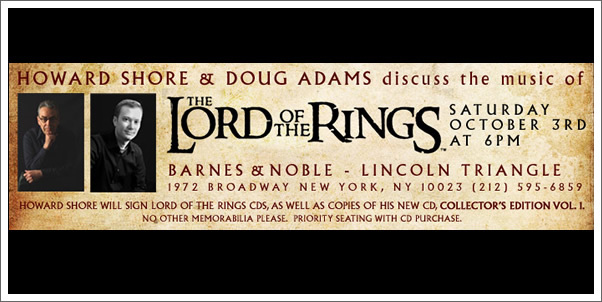 Come see Howard Shore and Doug Adams discuss music from The Lord of the Rings -- Don't miss a special appearance by Howard Shore and Doug Adams as they discuss music from The Lord of the Rings. Howard Shore will sign Lord of the Rings CDs, as well as copies of his new CD, Collector's Edition Vol. 1. No other memorabilia please. Priority seating with CD purchase.